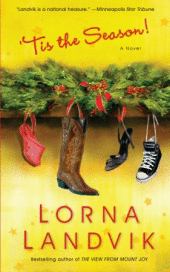 I’m a big fan of Lorna Landvik, and ‘Tis the Season didn’t disappoint. It did, however, surprise — I was not expecting an (electronic) epistolary novel in the least. Landvik’s newest novel, which was published so closely on the heels of The View From Mount Joy that I didn’t even realize it was out there until I happened upon it in the library, is just that: a novel in letters, most of which are actually emails. Like her other works, this novel is a page-turner. I picked it up hoping for a little light reading before bed, and ended up finishing it before going to sleep last night. Now, I’ll be the first to admit that that’s not as rare for me as it is for most people (happens at least once a month, but oftentimes more), but it was still quite an accomplishment considering I’d had less than 6 hours of sleep the night before and spent the day in and out of airports in 3 different time zones. I just couldn’t put this one down! The emails were, at first, seemingly unrelated…but in that wonderful way that some authors can facilitate, they came together by the end as the characters met and developed/rekindled relationships with each other.It was one of those books I was sad to see end, not because it had a bad ending (what a great ending!) but because it was so good I didn’t want it to be over. It makes me want to revisit some of my favorite Landvik (Angry Housewives Eating Bon Bons and Tall Pine Polka being my two ultimate favorites). I think what she does that I like so much is capture the essence of friendship in her tales. Her characters’ struggles and their dependence on their friends not only makes her books great reads, but also reminds me of the great people I have in my own life. I’m glad I found this one — what a great read!